Astronomy textbooks typically present galaxies as staid, solitary, and majestic island worlds of glittering stars. But galaxies have a wild side. They have flirtatious close encounters that sometimes end in grand mergers and overflowing "maternity wards" of new star birth as the colliding galaxies morph into wondrous new shapes. Today, in celebration of the Hubble Space Telescope's 18th launch anniversary, 59 views of colliding galaxies constitute the largest collection of Hubble images ever released to the public. This new Hubble atlas dramatically illustrates how galaxy collisions produce a remarkable variety of intricate structures in never-before-seen detail. Astronomers observe only one out of a million galaxies in the nearby universe in the act of colliding. However, galaxy mergers were much more common long ago when they were closer together, because the expanding universe was smaller. Astronomers study how gravity choreographs their motions in the game of celestial bumper cars and try to observe them in action. For all their violence, galactic smash-ups take place at a glacial rate by human standards - timescales on the order of several hundred million years. 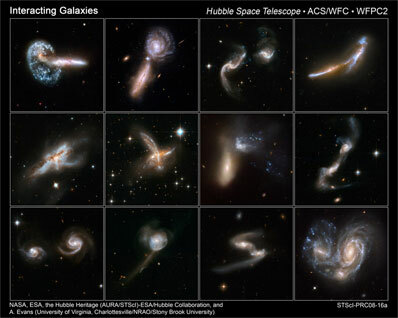 The images in the Hubble atlas capture snapshots of the various merging galaxies at various stages in their collision. Most of the 59 new Hubble images are part of a large investigation of luminous and ultra-luminous infrared galaxies called the GOALS project (Great Observatories All-sky LIRG Survey). This survey combines observations from Hubble, NASA's Spitzer Space Telescope, NASA's Chandra X-ray Observatory, and NASA's Galaxy Evolution Explorer. The majority of the Hubble observations are led by Aaron S. Evans of University of Virginia, Charlottesville/NRAO/Stony Brook University.